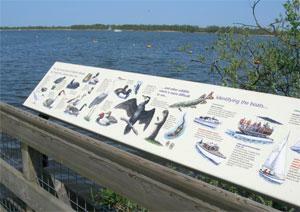 Shelley Signs are specialist suppliers of interpretive signs and panels. The company supplies design, printed graphics, frames and other supporting structures. All of Shelley Signs work, minus steel fabrication, is undertaken in their very own Shropshire factory, which you are welcome to visit and observe the expertise. At Shelley Signs, we provide the following services: doing the design from all its component parts, supplying illustrations, creating artwork for maps, and editing or researching your interpretation content. Your choice of frame has a massive impact on your interpretive panel. Our most popular materials which are chosen are oak, pressure-treated softwood, or steel (either galvanised and powder-coated or stainless steel). Lectern frames, with the display set at an angle, tend to be popular for interpretation panels. Word length – For a typical A1-sized panel we suggest a maximum of 200 words. Overcrowding the sign with words will make the reader lose interest. Illustrations – Attractive illustrations will not only break text up, but will make your sign look more attractive and help share your story. Maps – Avoid too much detail that could cause confusion. Key Messages – One or two informative key messages will stand out to readers and cause them to tell their friends… Creating more popularity. QR codes and Tags – A simple, yet effective way to advertise your website and encourage site visits. A vast range of materials are available at Shelley Signs for printing and finishing our interpretive panels. The aim of these materials is to ensure that an attractive, high quality and vandal-resistant finish is produced. The company works with a wide variety of materials; polycarbonate, acrylic, foamex, various timbers, and it’s most recommended material- encapsulated Glass Reinforced Plastic (GRP). This finish is tough and robust for outdoor graphics, yet it doesn’t detract from the quality of the print. It has been proven over the years to be a tried and trusted solution.